A 2 day course leading to the Silver National Navigation Award. 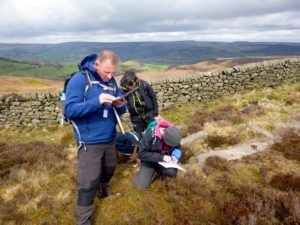 This course is for people who enjoy hill and moorland walking and wish to improve their skills and gain confidence off path and on moorland terrain. The course offers the opportunity to become proficient in the use of a map and compass, think about and plan strategies while walking off the beaten track. • Use a compass to follow accurate bearings and to check the direction of footpaths or other linear features on both map and ground. • Plan a strategy for a days walking on moorland and think about how you would break each stage down. • Understand and apply components of a navigational strategy to include ‘aiming off’, ‘attack points’, ‘collecting features’, simplifying navigation, and apply them in varying terrain. • Demonstrate an understanding of contour features, both large and small, on the map and on the ground. • Demonstrate an understanding of factors affecting route choice. • Judge distance accurately on the map and on the ground. • Employ simple relocation strategies. • Understand the affect of weather and staying safe in the moors and mountains. Demonstrate knowledge of the effects of fatigue and physical discomfort brought on by navigating in demanding countryside and/or extreme weather conditions. • Understand the impact walkers might have on the countryside, and how to minimise this when walking. The course is based in Foolow, starting at 10:00 am and finishing at 4:30 pm each day.